One of the most amazing pieces of Quorn history! 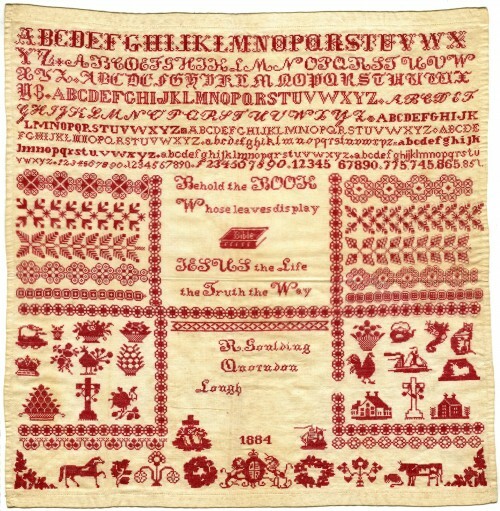 This intricately stitched sampler was made by Rosanna Goulding who was sent to the Muller Homes Orphan Houses in Bristol after her parents died in 1877. In 1884 she was released to the care of her eldest sister, Emma Dryden, who was married to John Dryden, the headmaster of Quorn Primary School. Read the full fascinating story of Rosanna, and what happened to her and her siblings, in an article which appeared in the Spring edition of the Quorndon in 2015. This is included on the museum website in artefact 1885.